Grocery shopping in Kimchiland (Western style) | Kimchi with Eish! This has been a good week. No this has been a great week. The Kids are writing exams so i get to go home at 1 three days this week. Also for one or other reason my stingy school has decided to compensate me for my after school classes. This was totally unexpected as I am within my required teaching hours. Nonetheless I appreciated the little extra I got! Something that has come up a few times in my blog is that i am generally full of crap!!! I don’t eat everything and I don’t necessarily want to try everything. It’s not that I don’t like Korean food it’s just that I miss South African food. So in an attempt to sooth my longing for “normal” food I went on a western food splurge to Homeplus! Now there is a Costco in town (the American version of Makro or Trade center) but its way on the other side of the city! The Costco has a great deal of imported American foods. So I spent about two hours in homeplus yesterday finding the most western foods possible. 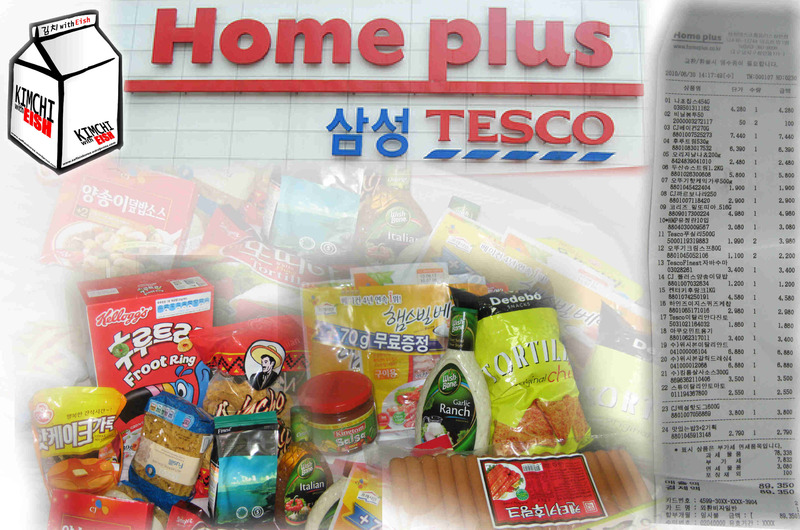 Homeplus is like a Pick & Pay Hypermarket. You can buy absolutely everything there, from groceries to appliances to clothes to books! In my food quest I came across some delicious treasures! Ok, many of them are imported and a bit pricey but heck I don’t care! So here are some of the food i got! No. 1 on my list is my all time favourite cereal Fruit Loops. Kellogs discontinued Fruit Loops in South Africa a few years back so the fact that I can enjoy a bowl of Fruit Loops in the morning make it worth while to wake up. But only for about a week each month as I usually buy the small box and I’m allowed one box a month! To Koreans Pasta equates to spaghetti. So whenever you find any variations of pasta it’s necessary to buy it. I’ve had enough spaghetti to last me a lifetime. When the menu in a restaurant says linguine or fettuccine you can be certain it will be spaghetti (apart from Pasta e Basta downtown). To go with my pasta I bought some Alfredo cook-in Sauce. Also I found some Italian salad dressing and Ranch sauce. Heinz Tomato Sauce is the closest they have to All Gold and it’s also imported. I also discovered some Tortilla chips and Salsa (Yummy). I also bought Tortilla wraps. There are Vienna sausages in every Korean supermarket and luckily I like Vienna Sausages so i bought a big pack. WARNING: Koreans wrap their Vienna sausages in an invincible plastic wrapper. Yes each Vienna is individually wrapped. Now i am sure they warn you about this on the packaging but due to my lack of Hangul comprehension I missed it. A teeny tiny picture on the packaging would’ve been nice. But no! So one night I ended up eating plastic! Anyhow, i also got some filter coffee imported from Tesco’s in England. I refuse to pay 15 000 Won for Starbucks ground coffee and the Tesco’s espresso ground coffee is just as good. I can’t drink Korean instant coffee as it has absolutely no caffeine. Also I’m not an instant coffee person! I also bought a packet of flapjack quick mix. All you need to add is eggs and milk. Nicola made it the other day and it was good! Grocery shopping is a very daunting task and it can be very confusing. The more time you spend in a supermarket the better you get to know the products. It’s best to avoid Korean supermarkets on weekends and between 7pm and 10pm as it is crazy busy! Another blog will follow soon about my take on Korean food. So for the second time today – Cheers from Kimchiland!